To understand what's different about ICE, it helps to think of how other law enforcement agencies work. I live in Grand Rapids. And if I want to know what’s happening with crime in my city, I can get a lot of information. I can search through bookings at the local Kent County jail. I can look at crime maps. And if I have questions about what Grand Rapids Police are up to, I can call Terry Dixon. He's the public information officer for GRPD. "My goal for the day is literally to assist with getting the information that the public wants or is in need of," he says. That information can include a public comment from Dixon, or an arrest report, or footage from a police officer’s dashboard camera or footage from a body cam. All of that is available. It can be scrutinized, judged. And GRPD has been judged heavily. But Dixon says the department is committed to being open with the public it serves. A lot more law enforcement agencies are headed in that direction. But not the federal law enforcement agency that targets immigrants. Getting even basic information out of Immigration and Customs Enforcement is difficult. And not just for reporters. "I first talked by phone with the deputy field office director, Mark Hamilton, and then I sent him a few hours later a request for information," says U.S. Rep. Sander Levin, D-Royal Oak. Way back in June, Levin says he reached out to the leadership of the ICE office in Detroit to ask about a specific operation – an operation in which local ICE officers arrested more than 100 Iraqi immigrants in metro Detroit. "No doubt, some of the people have criminal records, and in some cases, from what we understand, serious ones," Levin says. "We’re not excusing that for one second." But there are others arrested for less serious offenses. And Levin says he wants the proof for why ICE claims these people pose a “very real public safety threat.” His office requested the names of those arrested, their criminal histories and other details. That request was made more than a month ago. Levin’s office still hasn’t gotten the information. "I would compare ICE with the CIA," says Susan Long of the Transactional Records Access Clearinghouse. "We are also in litigation against them." And ICE’s secrecy isn’t limited to just that one operation. "I’ve been doing this kind of work, back going into the early '70s, says Susan Long, co-director of the Transactional Records Access Clearinghouse at Syracuse University. TRAC has a long title, but its mission is pretty simple. It submits Freedom of Information Act requests to agencies all throughout the federal government and then posts the records online for people to see. "What’s an agency that you have more trouble with than ICE?" I ask Long. "I would compare ICE with the CIA," she says. "We are also in litigation against them." "So," I ask, "ICE is as secretive as the CIA, in your experience?" "Well," she says, "in terms of the records we’ve been seeking, yes." But ICE isn’t the CIA. The CIA doesn’t make arrests all over the country. I did reach out to ICE, multiple times, for comment on this story. I submitted a public records request for information on the arrests in metro Detroit in June. That’s even though ICE regularly releases the names of certain people it arrests. No one from ICE would agree to an interview to clarify the policy. 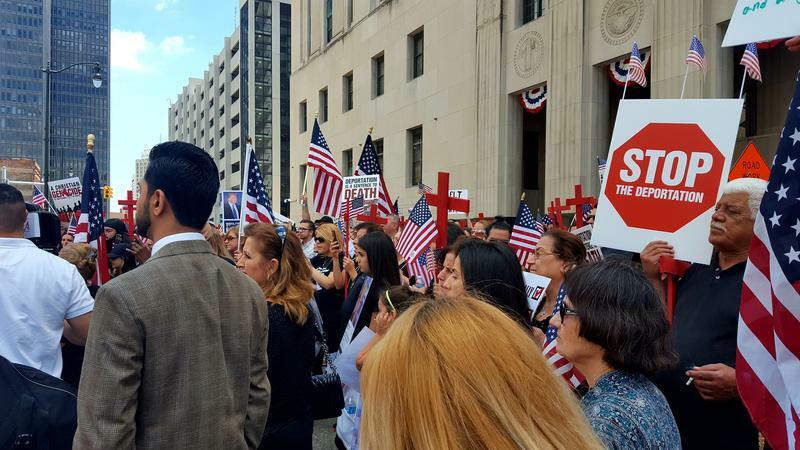 Lafayette Street between Shelby and Washington Boulevard in downtown Detroit was flooded with people supporting several Iraqi-American immigrants facing possible deportation. Immigration and Customs Enforcement, or ICE, arrested these immigrants in metro-Detroit more than a week ago. Most have criminal records, but have already served time or paid their fines. Carrie Heichle is the wife of one of the men arrested during the ICE sweeps. She says her two sons are having a hard time without their dad.